Over the weekend, the Ags bolstered their 2016 class with the addition of CB Travon Fuller. 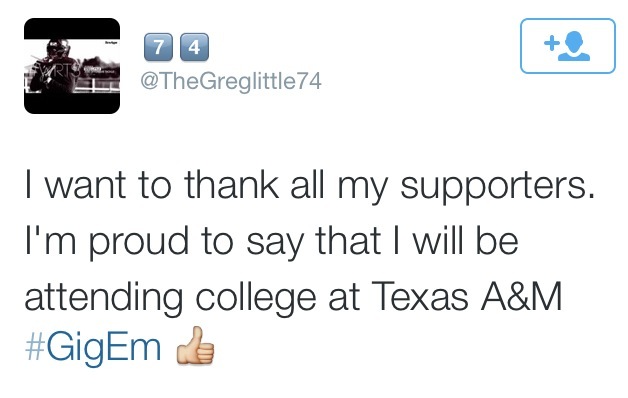 The consensus 4-star recruit is from Athens, TX and continues the trend of A&M snagging top talent out of east Texas. Often known as bEasts of the East, Aggie football was at its best in the 1990’s when A&M was able to hand pick talent from this area. Three of A&M’s top defensive recruits for the 2015 class all come from this area; DT Daylon Mack (Gladewater,TX), S Justin Dunning (Whitehouse, TX), S Larry Prior (Sulphur Springs, TX). Fuller checks in at 5’11” 160lbs and is currently listed as the 132nd best overall prospect, the 12th best at his position, and the 14th best player in Texas. As a sophomore, he tallied 53 tackles with 7 interceptions. He also played wide receiver and was credited with 413 yards and 5 touchdowns in 2013. 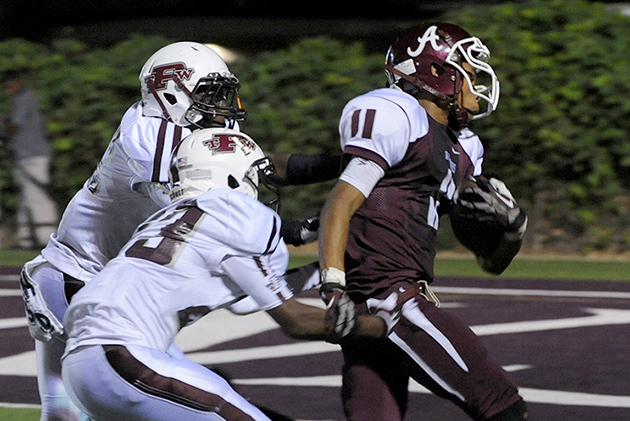 The Aggies have landed an elite playmaker in Fuller and their second recruit of the 2016 class. Coach Sumlin and staff are getting a jump start on the 2016 class with this commitment and their unofficial recruiting day this past Saturday. With several 5-stars and 4-stars taking in A&M’s first fall practice, they all left Aggieland very impressed. 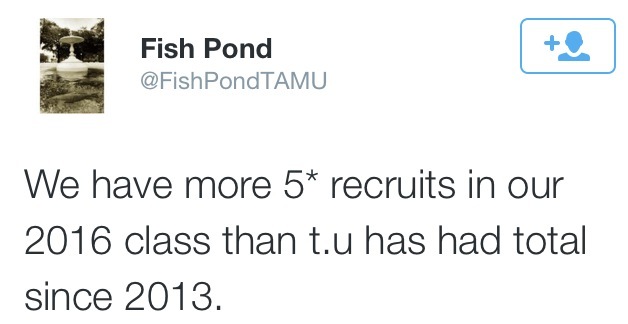 Sumlin is already in good shape with his 2015 class, but is relentlessly recruiting to increase the depth and talent. It’s amazing when a plan comes together. The Aggies put the finishing touches on the new football locker room this past week and will reveal it to the players later today. The buzz and excitement surrounding the new facilities, fall camp, and a new era in Aggie football is palpable and has made College Station the place to be. This fact has not gone unnoticed by the coaching staff as they are bringing in the top talent in Texas this week to take it all in. Here is a running list of visitors. OL Josh Wariboko – 6’3” 314 lbs. The 4-star recruit visited A&M yesterday. He is the top recruit out of Oklahoma and was committed to OU until April 2014. Upon opening up his recruitment again, the elite lineman has become a high priority target for the coaching staff. LB Ricky DeBerry – 6’2” 237lbs. The 4-star outside linebacker out of Richmond, Virginia is visiting the Aggies today. He is the 123rd best player in the nation and the 9th best player at his position. 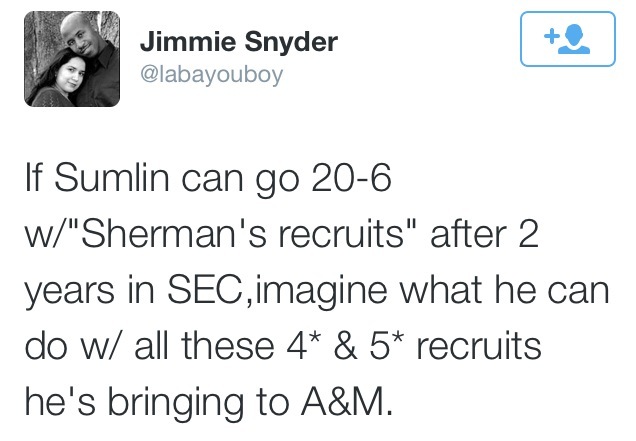 His visit just goes to show the recruiting reach that Sumlin and his staff are developing. S Eric Monroe (5-star recruit) – 6’0” –180lbs. WR Devin Duvernay (5-star recruit) – 5’10” –184lbs. DE Isaiah Chambers (4-star recruit) – 6’4” 237lbs. DT Braylon Jones (4-star recruit) – 6’3” 278lbs. LB Dontavious Jackson (4-star recruit) – 6’2” 238lbs. All the 2016 recruits are visiting on Saturday where A&M will host unofficial recruiting day. Why wouldn’t you want to play in the SEC close to home if you want to go to the NFL? Not a better way to get ready. Not to go unmentioned, Greg Little is not so little. Entering his junior season, the nation’s top tackle is already 6’6” 280lbs. With quarterback Kyler Murray, he already has two 5A state championship rings, and they both look to add a third this upcoming season. Little joins one other recruit for the 2016 class, fellow 5-star Patrick Hudson. Should A&M not land a single other offensive lineman between now and signing day February 2016, they could still end up with the top rated offensive lineman unit in the country. 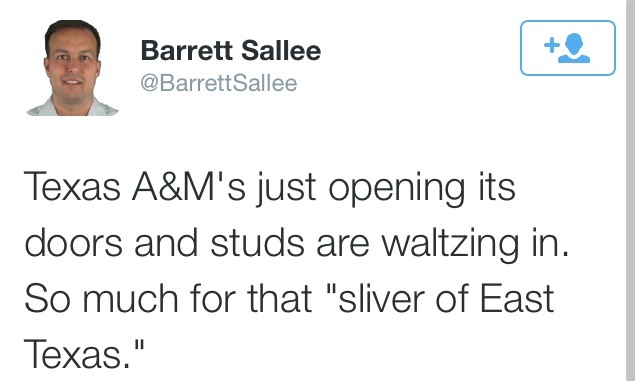 Simply put, recruiting in Aggieland is at an all time high.